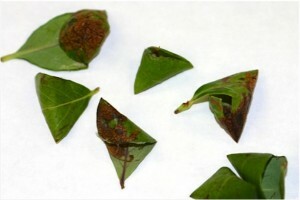 Teepee shelters containing Blueberry Leafminer. Only 1 larva is found per leaf. The blueberry leafminer is generally not considered an economic pest problem mainly because larvae experience high levels of parasitism in most blueberry fields. Larval parasitism can reach levels up to 80%. Use of broad-spectrum insecticides can have a severe effect on the natural enemy populations of the leafminer. Because of potential contamination, the blueberry leafminer might be a problem if you are processing more blueberries than usual. Blueberry leafminer larvae may become a contaminant, especially in machine-harvested fruit, as larvae drop from the bushes together with the harvested fruit. Under this special circumstance, treatment may be justified. Otherwise, we do not see the need to treat for this insect. Adults are small moths. There are two distinct flights: the first flight begins in late April-May and second flight beginning early July. Females lay their eggs on the underside of leaves, often more than one egg is laid per leaf. 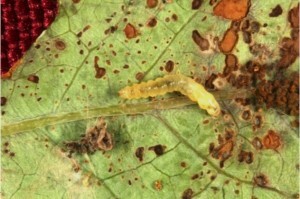 After hatching, larvae bore through the leaf epidermis and feed on plant sap, creating distinct mines. Later instars will feed on leaf tissue inside or outside the mine. The 4th instars exit the mine, fold a leaf into a tent (tepee), and will feed on the leaf tissue inside the tent (see picture). When mature, larvae leave the tents and pupate on the underside of the leaf. This insect overwinters on the soil as a mature larvae enclosed inside a cocoon on a senesced leaf. Blueberry Leafminer 4th-instar larva feeding inside teepee.